Qatar’s housing market remains depressed, amidst a sharp economic slowdown and the adverse impact of the diplomatic crisis. The nationwide real estate price index dropped 3.67% during the year to Q3 2018, after last year’s 3.47% y-o-y decline. However, property prices rose by 5.25% q-o-q during the latest quarter. Nationwide real estate transactions reached QAR 17 billion (US$4.67 billion) in the first nine months of 2018, up 14% from a year earlier, according to consulting firm ValuStrat. 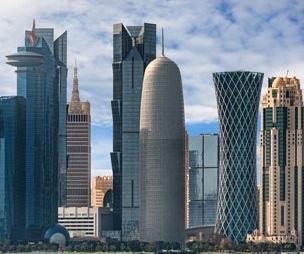 A new draft law for foreign real estate ownership is expected to buoy property demand in Qatar, as well as increase foreign direct investment. Rents, rental yields: no yields data is available in Qatar. Recent news. The economy is expected to grow by a modest 2.7% this year, from annual average growth of 2.1% in 2016-17, 4.2% during 2012-15, and 15.7% in 2008-11.